Wes Sanford at Northrop & Johnson sends news of a further $450,000 price reduction on his central listing for sale, Mangusta’s 27.9m motor yacht Kampai. Kampai was built by Overmarine in 2005 to Bureau Veritas class and has been used for only three weeks per year, the other 49 weeks being stored under cover. She is stylish, fast and perfect for entertaining, with two dining areas – a formal indoor dining room and an outdoor deck for alfresco meals. MCA compliant, Kampai accommodates nine guests in four staterooms - a master suite, VIP stateroom and a double and a twin with Pullman berth. All staterooms are en suite. 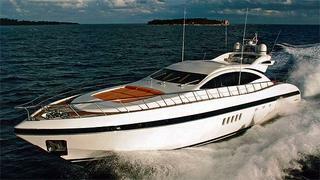 Twin MTU 16V 2000 M91 engines give her a pacy cruising speed of 28 knots and a maximum speed of 35 knots. She also has an Atlas shore power converter for use in Europe and the US. Lying in Fort Lauderdale, Kampai is now down from $2,950,000 to $2,500,000, duty paid.